The fountain of youth may actually exist in Toronto. Or at least, this is what some of our H & M Dental patients think when they come visit us for teeth whitening. Nothing gives a vibrant, youthful appearance like a beautiful smile and white stainless teeth. At H & M Dental and Associates, our dental staff offers patients effective teeth whitening in two forms – in-office one-hour teeth whitening or professional grade take home teeth whitening. Do you really offer whitening to your patients for free? Yes, our regular patients who maintain their regular cleaning appointments with us regularly receive their whitening package for free. Here is the best part, as long as you are maintaining your regular checkup appointments you are eligible for your free whitening kit and you receive them on your regular visits for free. This program is designed to make sure our patients always maintain wonderful beautiful smile. There are many factors that contribute to teeth staining. There are environmental factors such as foods, beverages and cigarettes. Additionally, there are genetic factors which explains why not all people’s teeth are the same shade, even if they aren’t stained. The third factor contributing to stained teeth are ones that develop as a result from using pharmaceuticals such as tetracycline. The most common stains are due to environmental factors. Food, drinks, and cigarettes (including E-cigarettes) often cause surface stains which eventually penetrate the enamel and discolor the dentin. Once the stain reaches the dentin, it can dim the appearance of the whole tooth. How Can Teeth Whitening at H & M Dental Remove my Tooth Stains? Our Toronto dental centre uses a highly respected brand in teeth whitening. Our teeth whitening products, both take-home and in-office, incorporate hydrogen peroxide and carbamide peroxide. The combination of these agents create a chemical reaction on the tooth that breaks down the carbons creating the stains. Should I Choose Take-Home Whitening or One-Hour Whitening? Dr. Benjamin Ghotbi consults with his Toronto teeth whitening patients before moving forward with a whitening treatment. This means that each patient understands the differences and decides what will work best for them. In-office whitening offers a more dramatic difference in a very short amount of time, but some patients report their whitening results lasting longer with take-home whitening. 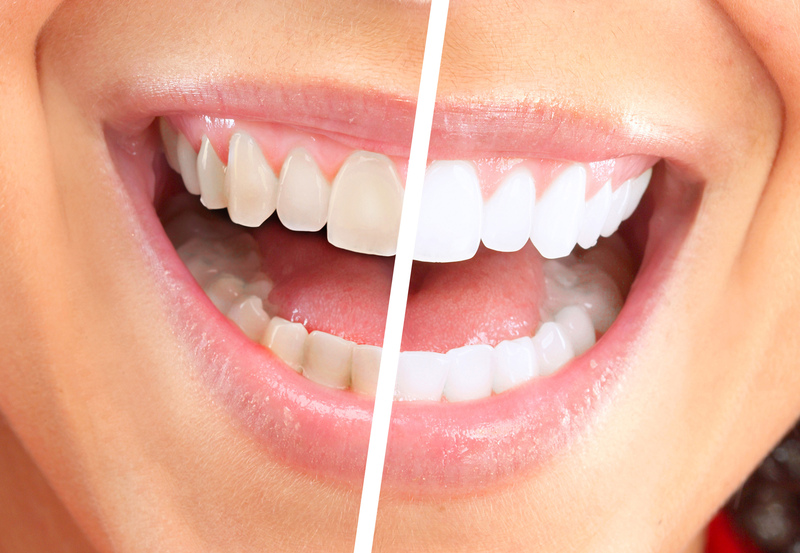 Other patients opt for both as they want to quickly have a noticeable brighter smile but also want to ensure long lasting results so purchase take home whitening for touch ups. As long as your oral health is in good order, either treatment should work well and brighten your smile many shades lighter. If you have any questions about our tooth whitening treatment, give our office in Downtown Toronto a call today. Our cosmetic dental solutions are sure to help you achieve the beautiful smile you desire.